7" All-in-One Universal 2Din Design. Adopt the newest Android 8.1 Oreo OS, 1024 600 HD Capacitive Touch Screen, Quad Core 1512MHz CPU, 2GB RAM and 16GB Internal Storage, Support extended 2 Card/2 USB Stick up to 4 64GB. Demo Video: English:www.youtube.com/watch?v=S45q9Z9iz4U Deutsche:www.youtube.com/watch?v=tay-MpDRZnU Packing: 1x MIBII by TP (6.5" 6RD 035 187B support CarPlay,MirrorLink) 1x AV Camera Adapter (Gift) Features: -MIB UI , Radio Size Same As RCD510 (215mm*180mm*130mm). -Support All PQ 35/46 Cars (can't use for MQB polo Golf7). -AM 530-1600; FM 87.5-108 -AM channels: 531, 540, 549 kHz.... in 9 kHz steps;FM channels: 87.5, 87.6, 87.7, 87.8MHz.... in 0.1MHz steps -Without unlocking code,and No component protection. -Radio Plug Size Same As RCD510 RCD310 RNS510. -Support Bluetooth ,USB ,Aux ,Sd Card,OPS,Camera(Only AV Camera). -Raido integrated BLUETOOTH handsfee module integrated microphone inside front panel. Radio Bluetooth Function: Contacts,Handfree phone call,Music streaming. 7"All-in-One Design for OPEL/VAUXHALL Cars with built-in CanBus Decoder (it cost GBP30 in the market). Adopt the newest Android 8.1 Oreo OS, 1024 600 HD Capacitive Touch Screen, Quad Core 1512MHz CPU, 2GB RAM and 16GB Internal Storage, Support extended 2 Card/3 USB Stick up to 5 32GB. Compatible multi-formats, vous pourrez profiter de vos musiques préférées sur CD audio, CDR, CDR-W, CD MP3 et CD WMA. Concernant les CD, lafaçade est basculante pour atteindre le lecteur CD. Lecteur CD. 7"All-in-One Design for OPEL/VAUXHALL Cars with Flat Frontpanel and Pure Touch-Buttons. Built-in Can-Bus-Decoder (it cost GBP30 in the market). Adopt the newest Android 8.1 Oreo OS, 1024 600 HD Capacitive Touch Screen, Quad Core 1512MHz CPU, 2GB RAM and 16GB Internal Storage, Support extended 2 Card/3 USB Stick up to 5 32GB. Radio FM stéréo de haute qualité numérique. -Intégré Bluetooth microphone. -1 x lecteur MP3 de voiture. Your cooperation will be highly appreciated. Détails d'expédition. Forfait inclus. 4 x 50 Watts. USB - HDMI. Bluetooth A2DP. B. Newest Android 7.1.1 system. Support system upgrade. G. Built-in Bluetooth 2.0 with A2DP/ Hands Free/Phone book. When the phone and the Car Android Audio Player through the Bluetooth connection, you can play the songs of your phone, and then by car audio output music, so that music around the whole space. Features: - System language is English - Work without code, no RDS & DAB -Radio Frequency ranges: FM / AM radio stereo. - Aux input, SD card (8GB), USB input directly at the front of the device. - IPOD (A2DP, load) - Bluetooth telephone connection and audio-treaming - 4 outputs - Up to 8 speakers - 4x20w (MAX: 4x45w) Fit: Passat B5 Golf MK4 Old Polo Packaging: 1 X Car Radio RCN210; 1 X Adapter with CANBUS Emulator; 2 X Removel Tools;. Je le vends car la voiture est hs. AUTORADIO MP3 USB. -4 x 50 Watts. - Connecteur ISO. - Recherche automatique avec 18 présélections. Radio rétro élégante avec tuner AM/FM et lecteur CD compatible MP3. L'éventail de fonctions de l'autoradio se voit compléter par l'ajout d'une radio AM/FM avec 18 stations FM et 6 stations AM programmables. 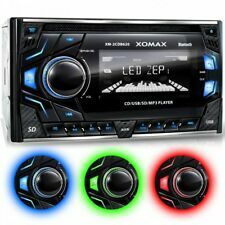 Language:English RCD510 Instruction: The radio is with code, and it is written on top side of the unit with 4 number 'XXXX' Full touch-screen system with 6CD changer, MP3 CD reader (for all 6CD slots) The radio is without DAB, RDS and SAT Systems. The radio supports maximal 32G HCSD The radio supports Optical parking system, but OPS function module is required, and you need to reset the programs The USB can read USB-stick, and it can connect with Iphone/Ipod. Radio FM: 87.5-108.0MHz (step0.1MHz) AM: 531-1600K (step9k,531,540,549…) 4X20W output If your car is produced before the year 2008,you need to change a new Gateway/CAN-BUS to avoid battery leakage. Autoradio Bluetooth Auna MD-130 slot SD port USB. RDS avec AF, REG, TA et EON. lecteur de média avec slots USB et SD et entrée AUX. tuner manuel et automatique. slots SD et USB pour la lecture de fichiers MP3 et WMA. Radio FM avec tuner PLL et 18 stations préréglées. Auna MD-200 2G BT Autoradio USB SD MP3 Bluetooth 3 couleurs. Tuner automatique et manuel. interface Bluetooth pour l'écoute de musique sans fil et la prise d'appel téléphonique. 1 Din Autoradio. 2 Din Autoradio. Android 6.0 Autoradio. Android 7.1 Autoradio. Autoradio pour VW. 1 x Lecteur DVD de voiture. - Fabricant de voitures: VW. Très apprécié pour votre soutien. Auto-radio MP3, FM,RDS. - Sortie pré ampli RCA. 4 x 50 w. Connecteur ISO. Auna MVD-220 Autoradio DVD USB SD AUX MIC. Autoradio DVD avec écran tactile de18cm (7") rétractable. Autoradio multimédia avec facade amovible, écran tactile de 18 cm, lecteur DVD, ports multimédia USB et SD et entrées et sorties AV. 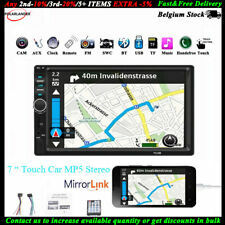 7" Universal 2Din All-in-One Design. Adopt the newest Android 8.0 Oreo OS, 1024 600 HD Capacitive Touch Screen, Octa Core 1512MHz CPU, 4GB RAM and 32GB Internal Storage, Support extended 1 Card/3 USB Stick up to 4 32GB. Language:English, Spanish, Portuguese, Russian RCD330 Instruction: This unit is compatible with the Android auto, carplay, mirrorlink -MIB UI RCD330 Plus, without CD player. Same Size as RCD510 Radio . - Supports All PQ 35/46 Cars (can not be used for mqb pole). -AM 530-1600; FM 87.5-108 -It does not need unlock code. there is no need to protect the components. -Support Bluetooth, USB, Aux, Sd Card, OPS, Camera (AV Camera only). -BLUETOOTH integrated module handsfee Raido microphone integrated inside the front panel. -The car model before 2009 is necessary to use the Canbussimuladoral load RCD330. -The car model before 2009 can not support multifunction steering wheel. do not support the bottom 8 of the steering wheel This unit is compatible with the Android auto, carplay, mirrorlink. 1 Lecteur MP5 de véhicule. 7 "High Digital Screen 800 480, écran tactile. 1 kit de câble de haut-parleur de voiture. 1 télécommande. Front AUX en fonction. Recherche rapide personnalisée, il est facile à utiliser. Tuner FM / AM RDS. Auna MVD-220 Autoradio DVD USB SD AUX MIC. Entrées USB et SD. Autoradio multimédia avec facade amovible, écran tactile de 18 cm, lecteur DVD, ports multimédia USB et SD et entrées et sorties AV. WinCE Autoradio. Android Autoradio. Autoradio pour VW. 1 x Lecteur DVD de voiture. - Fabricant de voitures: VW. EinCar, expert en électronique de voiture. Pourquoi acheter EinCar. 143.51 EUR. 1 Din Autoradio. 2 Din Autoradio. Android 6.0 Autoradio. Android 7.1 Autoradio. Autoradio pour Volkswagen. 7" 1 DIN HD Bluetooth Autoradio Stéréo USB FM écran tactile Rétractable MP5 AUX. Version Bluetooth: 3.1.2. Language: la langue du système est l'anglaise, avec le CODE System in English ONLY, NO other language, with CODE RCD510 Instruction: The radio is with code, and it is written on top side of the unit with 4 number 'XXXX' Full touch-screen system with 6CD changer, MP3 CD reader (for all 6CD slots) The radio is without DAB, RDS and SAT Systems. The radio supports maximal 32G HCSD The radio supports Optical parking system, but OPS function module is required, and you need to reset the programs The USB can read USB-stick, and it can connect with Iphone/Ipod. Radio FM: 87.5-108.0MHz (step0.1MHz) AM: 531-1600K (step9k,531,540,549…) 4X20W output Accessories: RCD510 x1 Manual x1 USB Cable x1. 1 Din Autoradio. 2 Din Autoradio. Android 6.0 Autoradio. Android 7.1 Autoradio. Autoradio pour Volkswagen. Moniteur voiture autoradio Stéréo Ecran Tactile vidéo lecteur. Véhicule d'occasion Pour volkswagen (Nouveau Magotan / Sagitar / Bora / Touran / Caddy / Tiguan / Scirocco / CC / EOS / R36 / Léon / crystal sharp / POLO / Passat (2010-2012) / 2011 Nouveau Lavida / New Santana 2013 / Skoda Octavia (2010-2013) / Nouvelle Polaris 2013 / Golf 7 / Nouvelle Jetta 2013). Note: Can not be used for MQB - Google Android 8.1 - Quad core processor, 1200MHz CPU - Integrated CanBus decoder, what can OPS / radar / climate control - Five-point capacitive touch screen, 1024 * 600 HD digital screen - 1GB RAM, 16GB internal memory - Radio tuner with RDS - Music / Radio / BT stereo player and time / date / week can be viewed in the status bar to show pull on main menu - Supports Google Maps Online Navigation, Android Maps Navigation - Supports Android Multimedia Player, it can play music / movie / photo from local disk or external USB. - Supports Google Play Store - Integrated DVR system - Supports mirror link with iPhone via WiFi and with Android Smartphone via WiFi or USB. And really appreciate if you can shoot a video to share your installation and use experience of JOYING Android car stereo on YouTube. • La nouvelle unité de Joying vient maintenant avec une sortie audio numérique SPDIF. BLUETOOTH : Kit main-libres avec micro extérieur. Ecoute la musique de votre GSM par bluetooth. Sortie vidéo. Entrée auxiliaire en façade. Sortie RCA pour ampli. Puissance 4x65w. WinCE Autoradio. Android Autoradio. Autoradio pour VW. Soutenir le contrôle original de volant de voiture. Cet autoradio comporte un écran tactile TFT de 7 "coulissant vers l'intérieur et l'extérieur de l'appareil. Avec sonDEH-X9600BT, Pioneer vous propose un autoradio au look épuré de qualité, doté du Bluetooth, de la compatibilité iOS/Android, de 2 USB, d'une entrée auxiliaire et d'un lecteur CD ! Tuner Autoradio RDS AM/FM (24 stations présélectionnées). Auna MVD-240 Autoradio DVD USB SD AUX MIC. Autoradio DVD avec écran tactile de18cm (7") rétractable. Autoradio multimédia avec facade amovible, écran tactile de 18 cm, lecteur DVD, ports multimédia USB et SD et entrées et sorties AV.